It was during our very first art class that we fell in love with the joys of paint. Despite an emphasis of more color on the page than our fingertips, we felt the colors just seemed to pop more on our skin rather than the plain white board. Clearly German artist, Gesine Marwedel feels the same. Her stunning works of art call to the ancient rituals and ceremonies of our ancestors (where body painting first appeared) while still speaking to the modern appeal of art today. Far from simple war paint yet more diverse than SI’s annual painted bikini feature, each piece is created to use the natural contours and textures found within his living canvas as a highlight to the scenes painted upon them. Inspirational on many levels, thought provoking and visually stirring, Marwedel’s pieces capture a variety of interests and landscapes. To see more of her work, take a peek at her gallery. 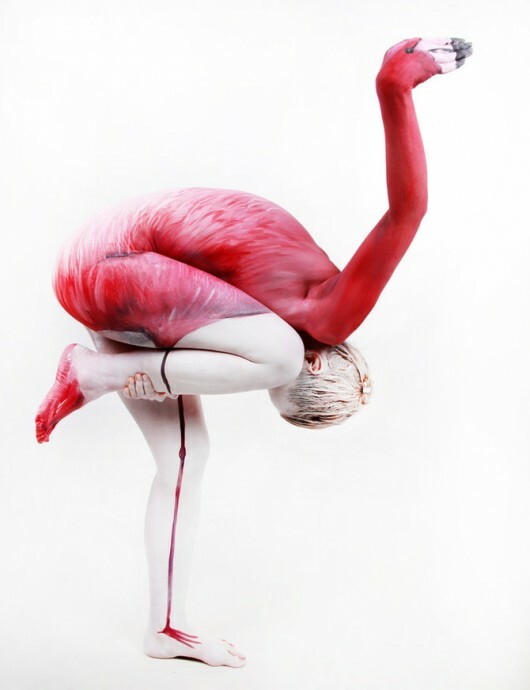 From flamingos to tigers and even the dark side of the moon, its a visual journey through the textures of the body and gloriously painted landscapes like you’ve never seen before.